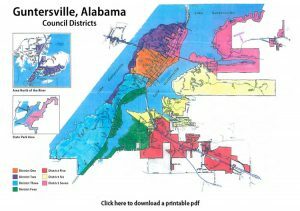 The City of Guntersville consists of seven voting districts. Each district elects one Council Member. The Mayor is elected at large. Elections are held every four years. The polling location for all districts is the Guntersville Recreation Center, 1500 Sunset Drive, Guntersville, AL 35976.